We only sell irises grown in our garden. Breezeway Iris Garden is a state licensed and inspected nursery. When processing your order and we find that an iris you bought is sold out or not suitable for shipping (first bought priority) we reserve the right to substitute an iris of similar color of equal or greater value. If you prefer no substitutions be made, please let us know in the comments section when placing your order. Irises are live plants and should be planted in late summer or early autumn. They need to be in the ground at least six to eight weeks prior to the first killing frost in your area. Do not put irises in the refrigerator and do not leave them out of the ground over two weeks. Irises will not bloom the year in which you plant them. Many will bloom in the following spring and some will take time to grow and acclimate with the best bloom coming in the 2nd and 3rd year after planting. All our orders are shipped via USPS Priority Mail. 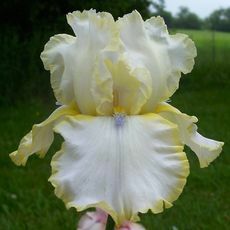 Shipping Fees: 1-10 iris at $7.00, 11-20 at $8.00 and 21-30 at $9.00 and 31 and above $10.00. Ship dates for 2019 are July 15, July 22, July 29. Iris will be bare rooted rhizomes, fresh dug, cleaned, labeled and shipped mid-July to the beginning of August. If you have a preferred shipping date please let us know in the comments section when placing your order. Customers living in the Madison area can pick-up pre-paid orders at the garden. Let us know you wish to pick up your order in the comments section when placing your order. If you pay by paypal I will not capture the shipping costs. If you pay by check simply subtract the shipping costs from your order. Payments are accepted for orders placed thru the website with Paypal or personal or cashier checks. Iris Prices are determined by their date of introduction and classification. Newer varieties are more expensive than varieties that have been available for several years. Some varieties that we have many of are offered with tiered pricing. Don’t know what to order? We can put together a package for you if you provide us with information of the number of plants, care, and type of iris that interest you. E-mail us with your request. Want to give Iris as a gift? Contact us for a gift certificate. A long-standing tradition of iris sellers is bonus iris. We do include bonus iris when filling our orders based on the dollar total of your order. If you do not wish to receive bonus iris please let us know in the comments section when placing your order. We guarantee all plants to be healthy and true to name as registered with the American Iris Society. If an iris variety is not correct please send us a photo of the iris in bloom and we will ship the correct variety at no additional cost as well as try to identify the mislabeled variety. Irises are guaranteed to arrive in good condition. If for any reason your iris are damaged in shipping or arrive in poor condition please notify us immediately so we can provide replacement plants. If we made a mistake in filling your order or you are not satisfied for any other reason, let us know as soon as possible and we will make amends. Please do not request a return or refund thru Paypal – it actually complicates the process because we have to follow their guidelines and it takes much longer resolve the issue. We cannot accept provide replacements for iris that do not make it thru their first winter because we have no control over when your iris are planted or growing conditions you or nature provide. You can view your on-line orders by registering and logging into your account. We suggest you print out a copy of your online order to keep for your records. Log into your on-line account and follow the prompts to update your account information. Breezeway Iris Garden will never rent or sell your personal information. Your info is safe with us!